Individuals with Down Syndrome (DS) are predisposed to develop acute megakaryoblastic leukemia (AMKL), characterized by consistent somatic mutation of the transcription factor GATA1. As a result, DS-AMKL cells express an N-terminally truncated GATA1 protein, GATA1s. The treatment outcome for DS-AMKL is more favorable than for AMKL in non-DS patients. To gain insight into gene expression differences in AMKL, we compared 24 DS and 39 non-DS AMKL samples. We found that non-DS-AMKL samples cluster in two groups, characterized by differences in expression of HOX/TALE family members. Both of these groups are distinct from DS-AMKL, independent of chromosome 21 gene expression. To explore alterations of the GATA1 transcriptome, we used cross-species comparison to genes regulated by GATA1 expression in murine erythroid precursors. Interestingly, genes that are repressed following GATA1 induction in the murine system, most notably GATA-2, MYC and KIT, show increased expression in DS-AMKL, suggesting that GATA1s fails to repress this class of genes. In contrast, only a subset of genes that are upregulated upon GATA1 induction in the murine system show increased expression in DS-AMKL, including GATA1 and BACH1, a probable negative regulator of megakaryocytic differentiation located on chromosome 21. Surprisingly, expression of the chromosome 21 gene RUNX1, a known regulator of megakaryopoiesis, was not elevated in DS-AMKL. 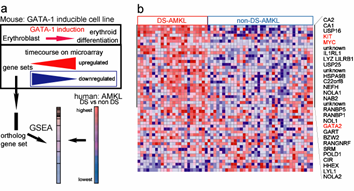 Collectively, our results identify relevant signatures for distinct AMKL entities and provide insight into gene expression changes associated with these related leukemias.